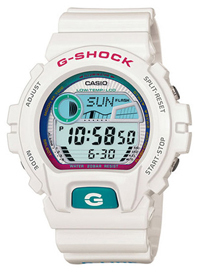 Sport Line “G-LIDE (G Ride)” on G-SHOCK, including the top surfers in the world, that support the sport system from Extreme, models appeared in summer 2010. Can also be used on the street is also on the beach, is a New G-LIDE. 6900 to the first type G-LIDE series is painted gloss, color rainbow color ring around the dial. The band has a line pattern Ashirai the image of strong summer sunlight.